From musicians and athletes to Nobel Peace Prize winners, business moguls and presidents, every professional is criticized about their work and their performance – and most will agree, begrudgingly perhaps, that they are better for it. It’s not easy to hear, but behind every critique lies a lesson. Those who are able to get past the harsh outer shell of criticism to the nugget of wisdom at its core will possess one of the major keys to success. Research we conducted using the SCRT (Sensitivity to Criticism Test) reveals that employees who were more defensive in response to criticism scenarios on the test were also more likely to report lower levels of job satisfaction and to have poorer performance ratings. 3) Whether they experience defensive emotions directed toward others (e.g. anger, bitterness, resentment, etc.). 4) Whether they experience defensive emotions directed toward themselves (e.g. sadness, embarrassment, guilt, etc.). 5) Whether they exhibit overt defensive behaviors (e.g. scowling, arguing with critic, threatening to quit, etc.). 6) Whether they exhibit covert or passive aggressive defensive behaviors (e.g. purposely slacking off, secretly looking for a new job, ignoring criticism completely and not making any of the recommended changes, etc.). Here’s what our study reveals: While women are more likely to direct their defensiveness inward (e.g. by taking the criticism personally; by being hard on themselves for not doing well), men are more likely to reflect their defensiveness outward, convincing themselves that the critic is wrong, and even going as far as to argue/disagree with the critique. Interestingly, one of the key factors that determined whether a person responded defensively to criticism was self-esteem. How do these employees react to criticism? How should you approach these employees when offering feedback? 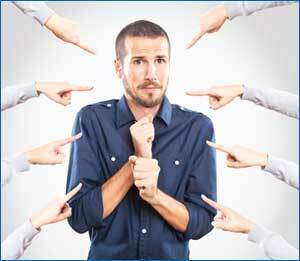 o Don’t say: “I am concerned about your behavior with other employees. People have been telling me that you are difficult to get along and work with. How should you approach this employee when offering feedback? Start by asking them to offer their opinion on their performance – what they feel they have accomplished, and areas where they would like to improve. Reassure them - make it clear that you appreciate their accomplishments and hard work, and recognize their value. Introduce criticism as untapped potential: “You are a great employee and I know you have a lot to offer. You have a lot of potential that I want to bring out, so here are the performance goals I would you like you to accomplish before the next evaluation…” Just make sure to check in regularly to evaluate the progress of development. If possible, make improvement a group effort. Have all employees in the department undergo a refresher training session. They are likely to be reserved, and will accept criticism with little input (or fight). This could also mean that they won’t speak up even if they do disagree or have something to add. Make it clear that you recognize the person’s strengths and values – list their accomplishments. When you start seeing improvement in the areas you mentioned, bring it to their attention; let them know that you’ve noticed their hard work and desire to improve. Offer regular encouragement and praise. Reassure them that your office door is always open if they have questions or need advice, and that you are more than happy to offer guidance. Boost their confidence – make it clear that you have recognized their hard work and their accomplishments. If you’re interested in using the SCRT (Sensitivity to Criticism Test) or other tests for HR purposes, request a free trial for ARCH Profile here.